Greetings from Florence, Italy. Wow! We have had just 24 hours here, and it’s not enough. I know you’re probably growing weary of me saying it, but we really love this place. On the move again. 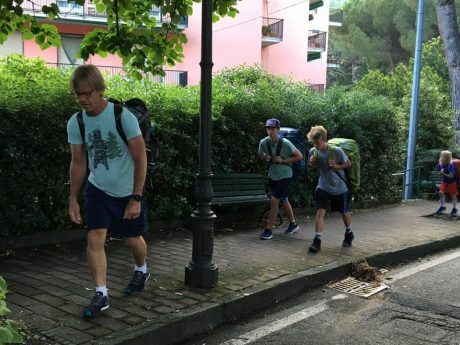 Jerry and the boys on our walk to the Moneglia train station. We like our hotel (Hotel Astrid), but the wifi is pretty dismal. As a result, this blog post will be mostly photos, with one video clip. I’m including pretty detailed captions with each. 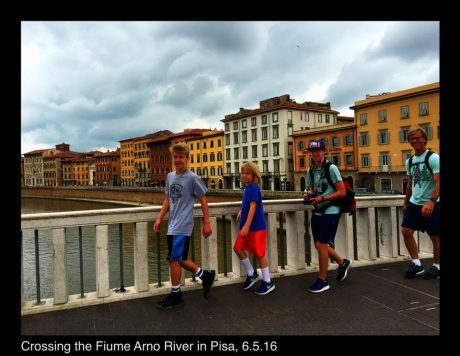 –We opted to get off the train in Pisa, so we could stretch our legs and walk to see the Leaning Tower of Pisa. This was not the highlight of our day, but it was nevertheless wonderful to see it. After two hours of walking around and taking photos, and – of course – having a gelato, we boarded another train that would take us to Florence. –Seeing Michelangelo’s David (1502-04) was an even greater experience than we expected. Michelangelo’s David, standing over 14 feet tall, represents the biblical figure of David, who killed the giant Goliath with a stone from his slingshot. 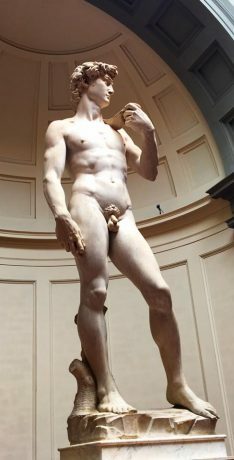 (From the gallery’s exhibit panel: “Nor has there ever been a pose so fluent, or a gracefulness equal to this, or feet, hands and head so well related to each other with quality, skill and design.” With these words, Giorgio Visari attempts to define the reasons behind the marvel that the vision of David provokes in the observer. It has always been the subject of debate among scholars whether David is represented before or after his victory over Goliath. 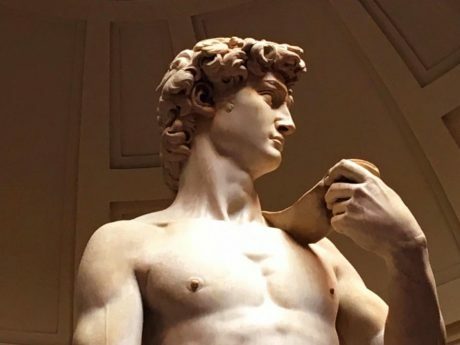 His sling is also barely visible as though to emphasize how David owed his victory not to brutal strength but to his intellect and to his innocence. 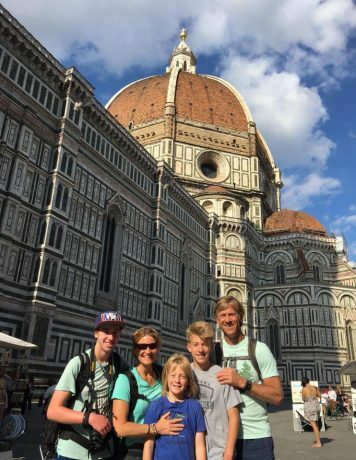 –After seeing David, and other art, we headed for the Cathedral of Florence, (The Cattedrale di Santa Maria del Fiore in English “Cathedral of Saint Mary of the Flowers”). It is the fourth largest cathedral in the world. (The largest are St. Peter’s in Rome, St. Paul’s in London, and the Milan Cathedral) This spectacular church is the main church of Florence, Italy. Il Duomo di Firenze, as it is ordinarily called, was begun in 1296 in the Gothic style with the design of Arnolfo di Cambio and completed structurally in 1436 with the dome engineered by Filippo Brunelleschi. The exterior of the basilica is faced with polychrome marble panels in various shades of green and pink bordered by white and has an elaborate 19th-century Gothic Revival façade by Emilio De Fabris. We stood in awe as we admired it. 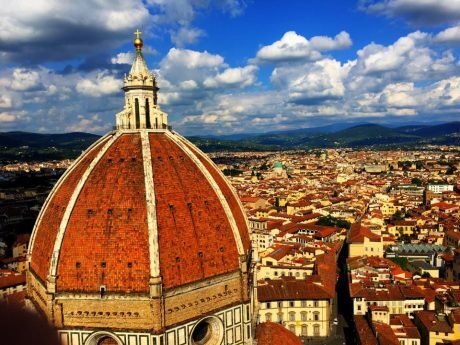 The UNESCO World Heritage Site covering the historic centre of Florence and are a major attraction to tourists visiting Tuscany. Its beautiful dome remains the largest brick dome ever constructed. –We ended the full day with an epically delicious Italian dinner from Mercato Centrale, a local produce & everyday goods provided in a high energy, spacious, 19th-century iron & glass market hall that has a great vibe. 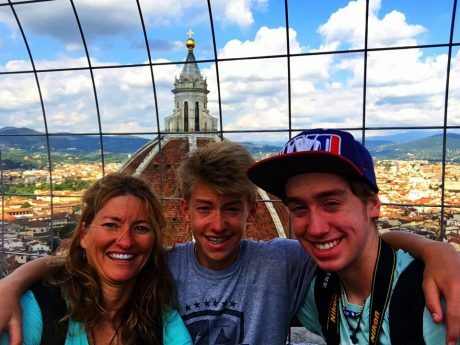 Thank you for reading, and for following along with us on this Epic Europe Family Adventure! Next up: Rome!